There’s so much to see in Fez I’m breaking this post into two parts. 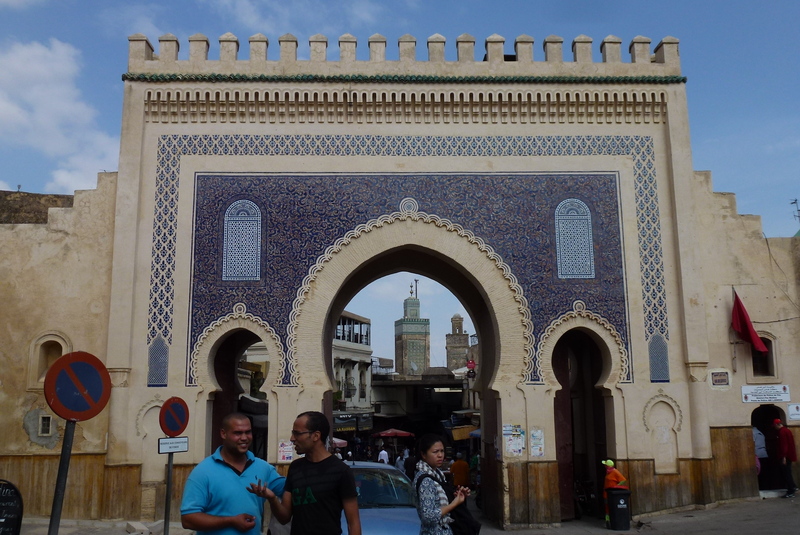 We arrived in Fez from Meknes (about 43 miles or 69 km). Fez was one of four imperial capitals of Morocco and was regarded as one of the holiest cities in the Islamic world due to its connection with Moulay Idriss who founded the city the late 8th century (see my post here for a little information on him). Travelers have been coming to Fez for a 1,000 years, its reputation as a center of learning religious heritage was known far and wide. Fez is a large city, and like most Moroccan cities it has a newer part (Ville Nouvelle) built by the French during their colonization period and an older section (the walled portion of the old city known as the Medina), which is huge, and is split into two parts (Fez el Bali and Fez el Jedid). Fez’s Medina is called the most complete medieval city in the Arab world. The streets and narrow alleyways wind all over and are intriguing to wander – don’t be surprised if you get a bit lost. An centuries-old water clock in Fez. It has 12 windows and the outside is being restored, but no one really knows how it functioned. There are maps of the Medina available and the locals will help you out too. All kinds of fun things lurk behind almost every corner. We wandered into a small tannery area by accident (I was just peeking through a gate) and got a fascinating tour. A hidden leather working area near a small tannery run by Berbers in old Fez. At another point we were taken up on top of a person’s house for a great view over the city. A view of Moulay Idriss II’s tomb from the roof top of a local’s home we visited. 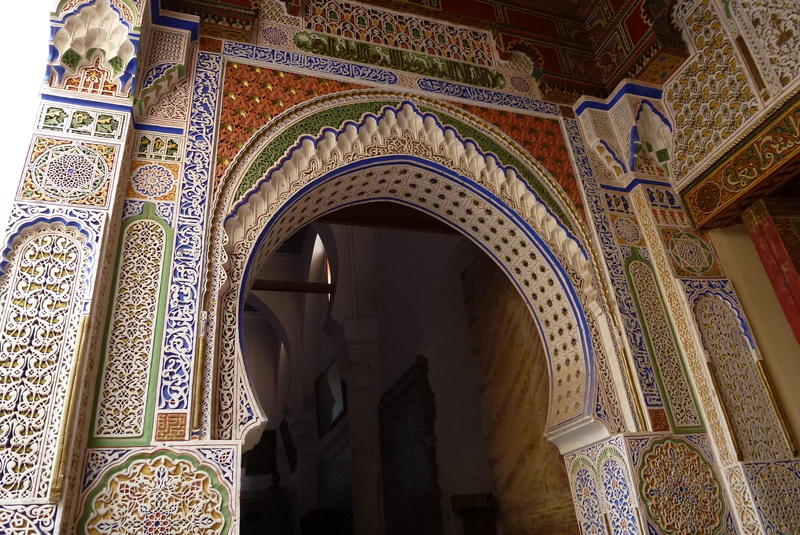 The entrance to the tomb of Moulay Idriss II, a holy site in Islamic culture. He was the son of the founder of Fez and lived in the 9th century. 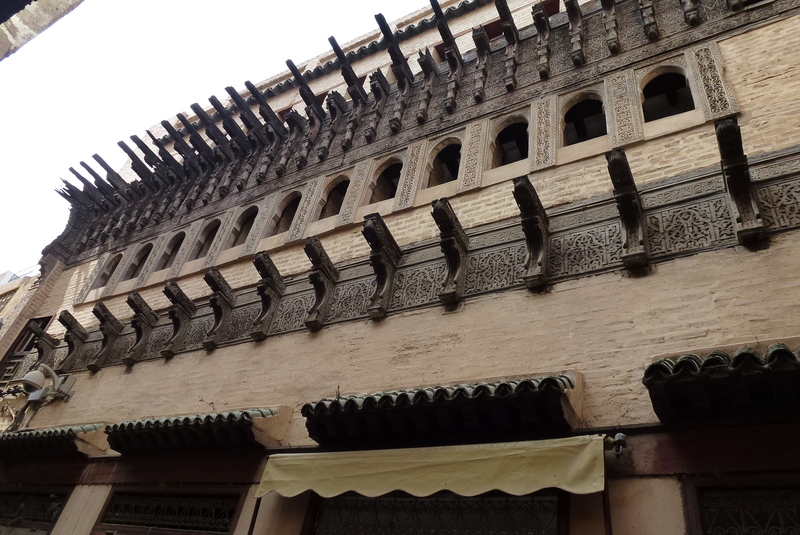 He established Fez as a place of refuge for muslims retreating from Spain and other places. Here as some of the highlights of Fez (more to come in another post). Walls and Gates. If you love medieval settings as much as I do, Fez will take you back in time. There are huge gates and walls everywhere and I didn’t figure out how they all connect. We wandered outside the walls in a few sections to get a feel for their extensiveness. 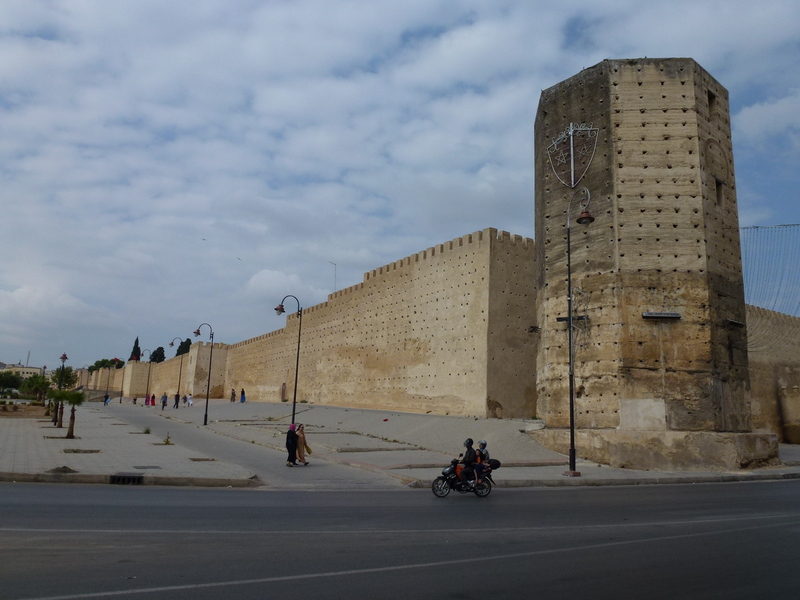 One of the main gate towers of Fez, known as Bab Sagma. The gate known as Bab Boujeloud. 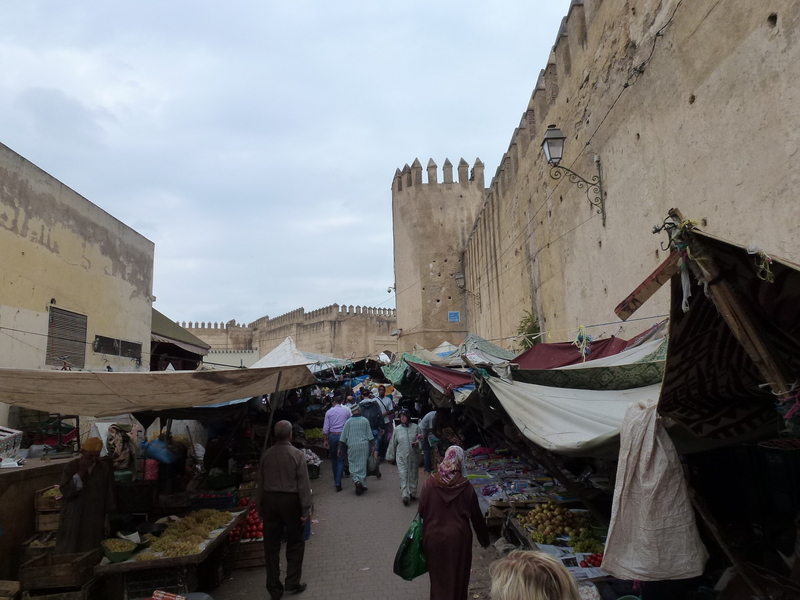 A market by the walls of Fez. Merenid Tombs. 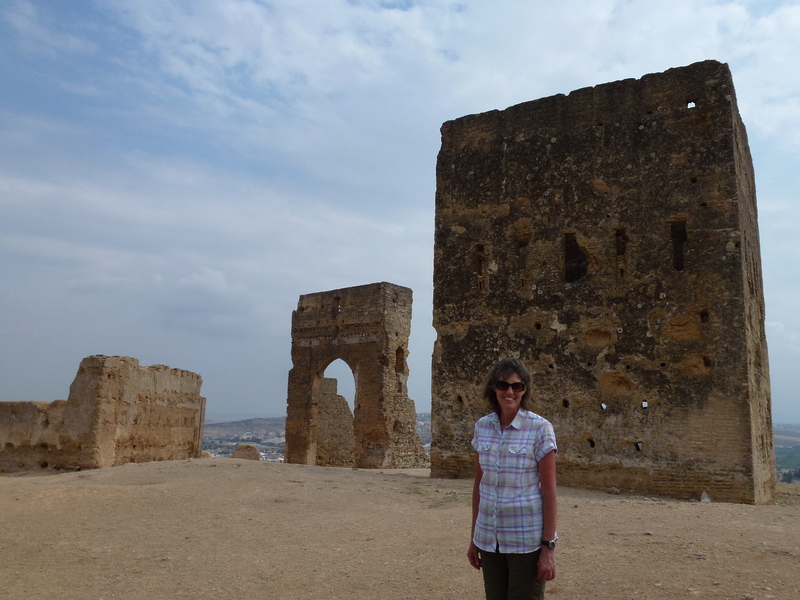 Just outside the walled city on a hillside are the ruins of the Merenid tombs, former rulers of Fez in the 13th century. While the ruins aren’t much, the views overlooking the old city are terrific. 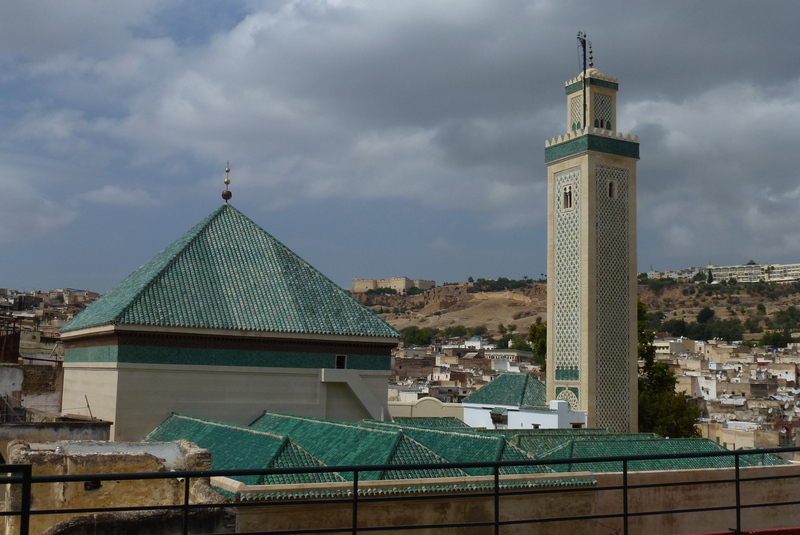 There are 365 mosque minarets in Fez, but we didn’t try to count them. 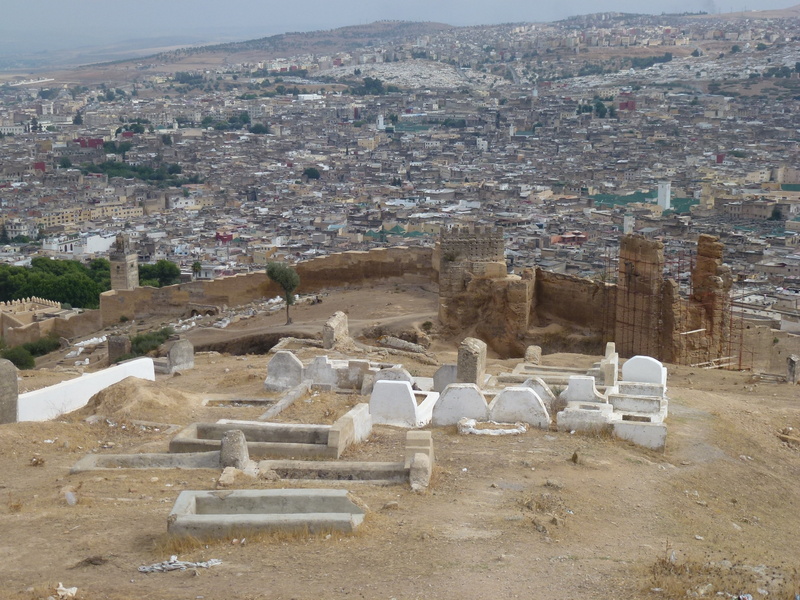 A view of Fez and its old walls from the Merenid Tombs. Ruins of the Merenid Tombs. Medersas. Medersa means “place of study”. These were student colleges and used largely as residence halls, since most teaching would be done in the mosques. 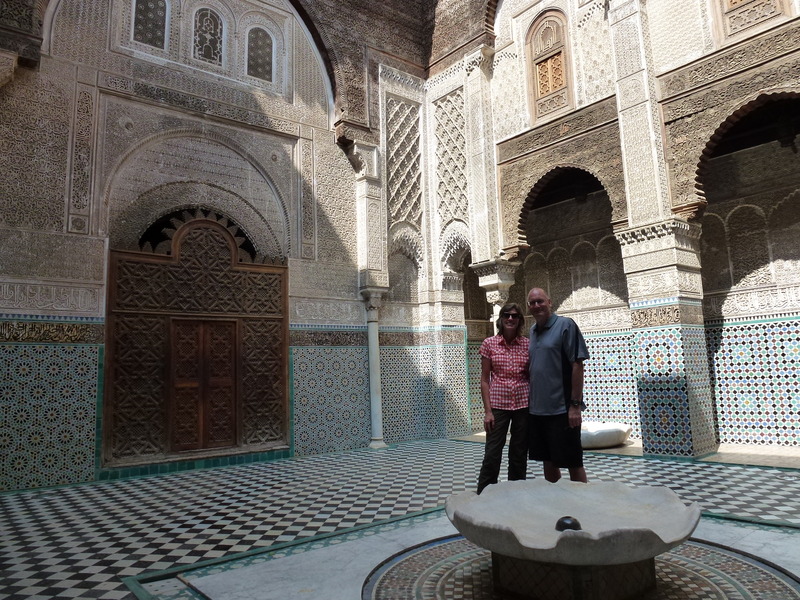 Fez was a great center of learning and the architecture of these halls is stunning. We visited two. The layout is similar – a main courtyard, student cells, prayer hall and oratory. Medersa Bou Inania. This is one of the highlights of a visit to Fez. The dark cedar wood, tile work and stucco is beautiful. This building is the city’s only building still in religious use that non-muslims are permitted to enter. It was built in the 14th century. 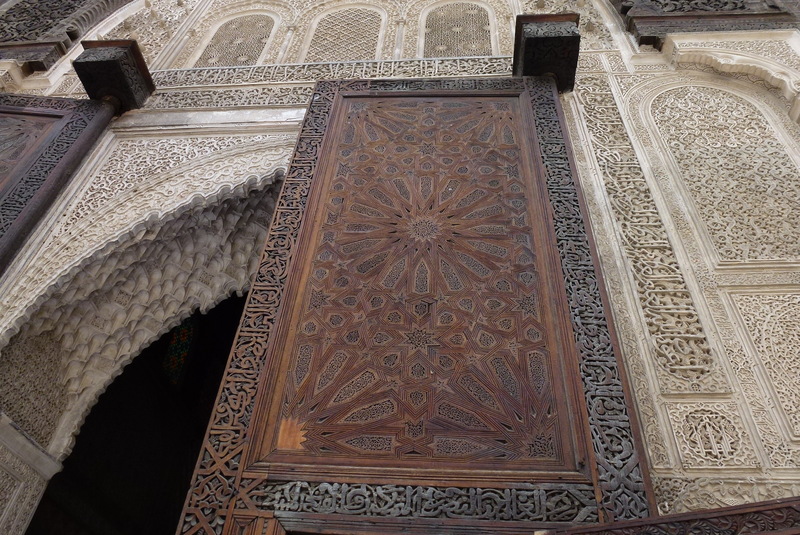 Detail of the intricate carvings at Medersa Bou Inania. 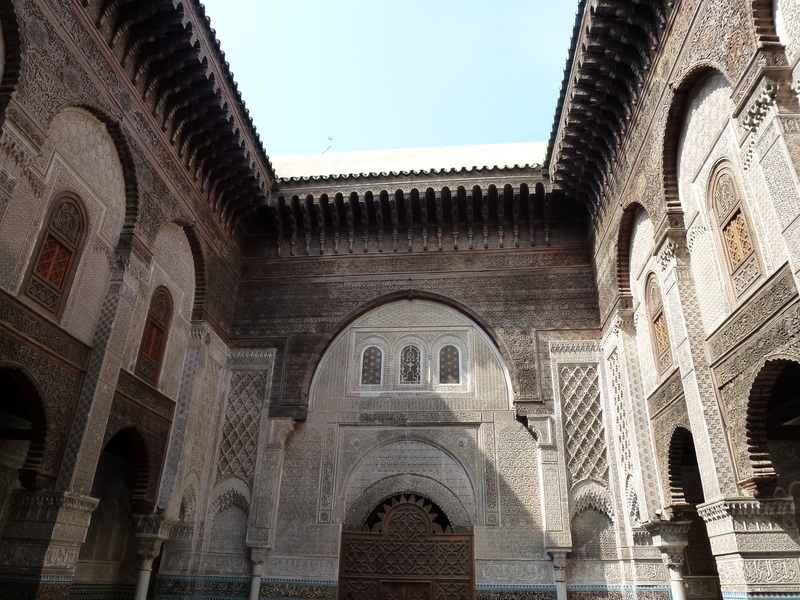 A view of the courtyard of Medersa Bou Inania. Medersa el Attarine. This building was completed in 1325 and is also beautiful. 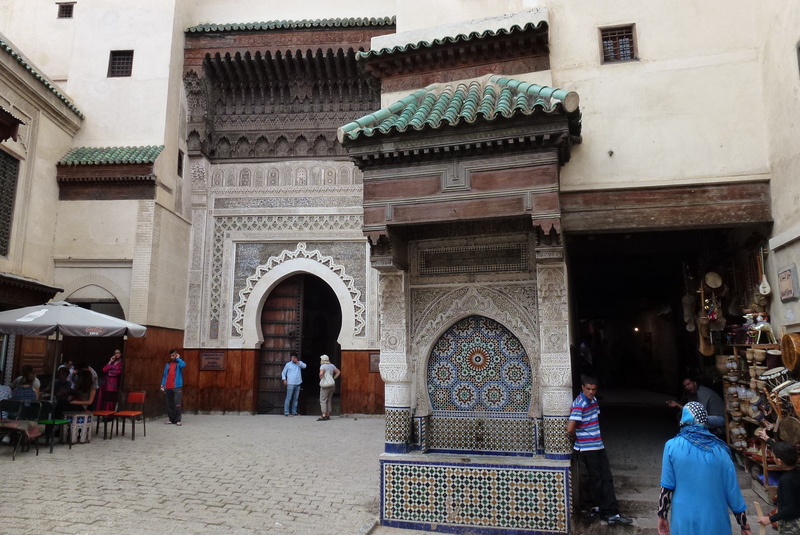 The courtyard of Medersa el Attarine. 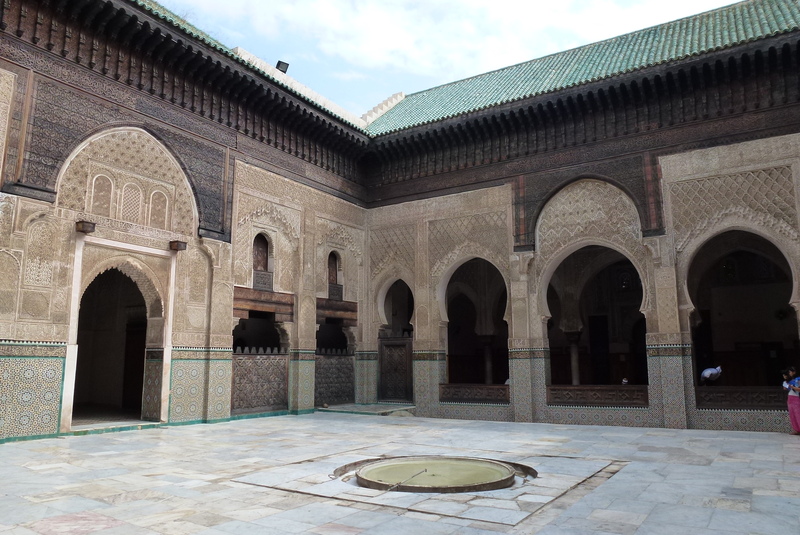 Another view of the courtyard of Medersa el Attarine showing the tile work. 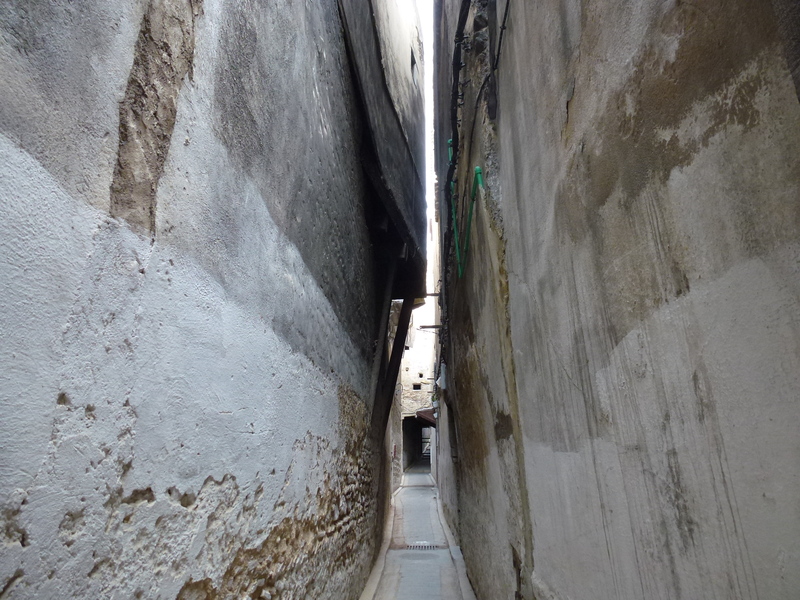 The narrow alleys of the Medina. As mentioned above, just wandering around the old Medina is fun. There are also a few squares where the locals gather. 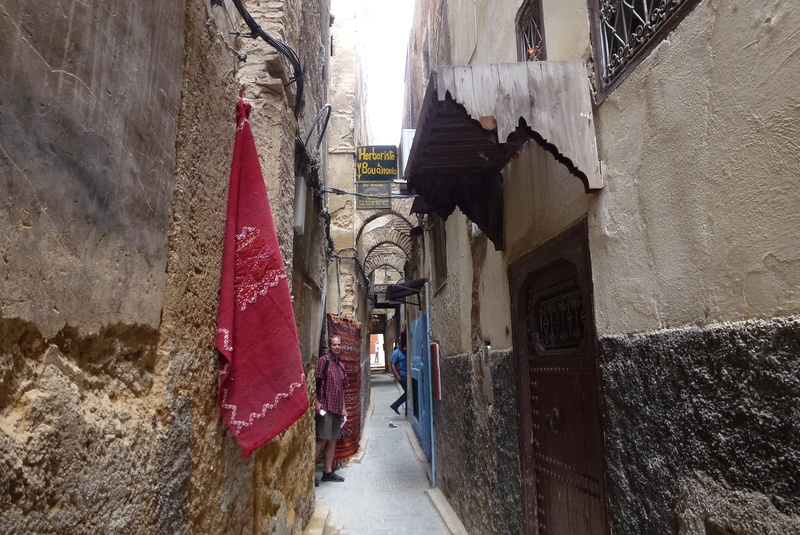 The buildings are almost touching in this narrow Fez Medina alleyway. Another alleyway in the Medina. A small square in the old Medina – Place en Nejjarine. There is a large museum in the background. 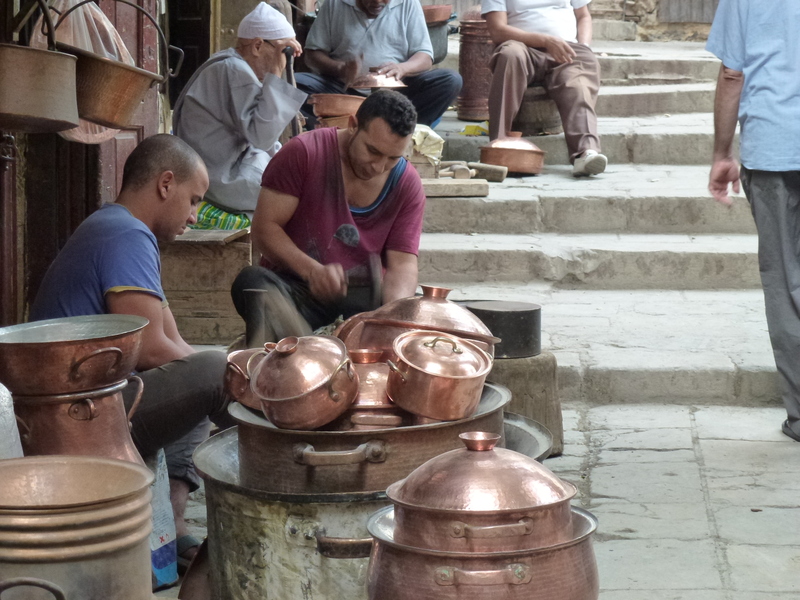 Another small square, called Place Seffarine with copper pottery being created. In my next post, we’ll explore the tanneries – one of the most interesting sights to behold anywhere in Morocco and also the Jewish Quarter, a dilapidated part of Fez that is pretty much off the tourist radar. For a map of locations visited in Morocco, click here. 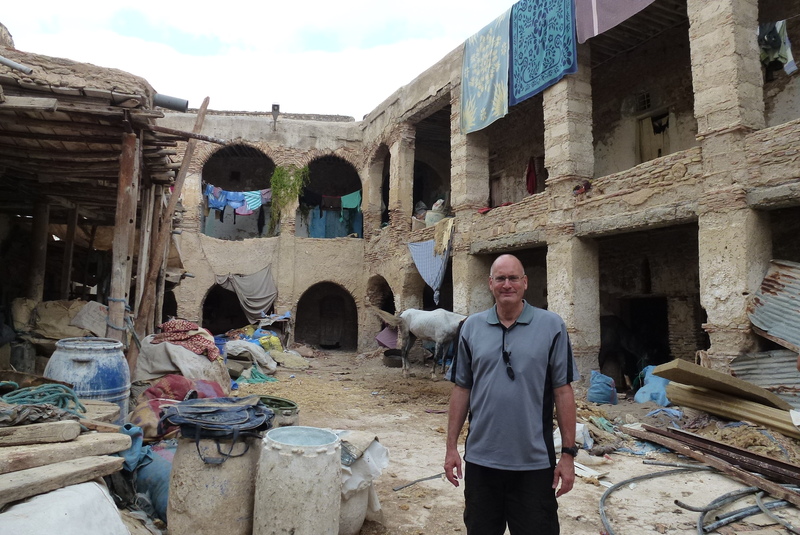 Posted in Morocco and tagged Things to do in Morocco, Things to see in Fez, Visiting Fez on July 21, 2015 by Paul Terry.